side hustle | Finding delight. * This post may contain affiliate links. If you consider yourself even the slightest bit interested in personal finance, you’ve heard it before — diversify your income streams. Whether you have a traditional 9-5 or work for yourself/freelance, new sources of income that can be made from home are often the goal. Especially if you don’t wanna tack on extra commutes (*raises hand*). ESPECIALLY if you’re introverted (*raises both hands*). In our super online world, there are all kinds of ways to make money without leaving your house, but finding the options that bring you joy can sometimes be tricky. If you have a hobby that you love and want to hone, consider how you might make money by turning this hobby into a side hustle, or even a full time gig. This is a great way to pull in a bit of extra cash along side a full time job. After-all, you’re already taking part in whatever this hobby is in your free time, right? Like to make cakes? Start a baking blog. Into scouting for vintage jewelry? Start an Etsy store. Painting savant? Start teaching an art class once a week. Even if you’re brand new to a hobby there are so many resources online to help you grow a side hustle. For instance, here’s how to become a microgreens farmer, a certified pet sitter, and an extra in tv and movies. Pay close attention to what makes you happy — whether that’s growing plants or hanging out with kittens or standing in front of a camera — and do more of it. Then, consider whether this could be a lucrative business option for you. If you have substantial knowledge in a subject, you could use this knowledge to help others. How? Become an online consultant or even a tutor. There are lots of sites out there for you to market your expertise and look for clients. If you’re willing to do a bit more work upfront, consider creating online courses on your favorite subject matter. If you already have an online following or email list, you can easily send out info about your new class. Without an embedded audience, there are great websites like Teachable and CreativeLive to consider. Sharing your knowledge and expertise can feel great when you’re talking to people who really want to learn! Many of us enjoy creating content for ourselves. You have full control over the message and you’re able to feel involved with the larger community of whatever your niche may be. Some people enjoy writing Ebooks, others like writing blogs, some enjoy making videos, the list goes on. It’s now easier than ever with sites like Upwork and Fiverr, to put yourself out there and use the skills you’ve acquired making content for yourself and do it for others. This could be as simple as writing a blog post or two for a website you love or designing cool slides for an influencer’s Instagram stories. If there’s an aspect of content creation you love, there’s definitely a way to monetize that! If you love taking pictures and consider yourself skilled with a camera, you could sell your photography to stock image sites. It can be a little bit trial and error to figure out what sort of images are accepted and do well on these sites. However, I’ve seen lots of folks make a killing once they hit a nice little rhythm. Even if you’re waiting to get accepted by the bigger sites, smaller, free stock image sites often offer incentives to photographers, like being able to link to a PayPal or Ko-fi account. That way, if someone really loves your image they can thank you for letting them use it. If you’re already walking around with a camera all day practicing photography, keep these stock image sites in mind. There’s no feeling quite like clearing out all of your unwanted stuff and then enjoying the free space of a decluttered home. Once you have everything that you no longer want, you can use online platforms to list and sell these items. One person’s trash is another person’s treasure! What am I missing Do you have any ideas for making money from home that you think could spark joy? The hustle. If you aren’t doing it at the minute, then you’re either really comfortable with your finances, or you just haven’t figured out how! You first need to dig deep, and find the drive to do this. If you don’t have the motivation to make more, you’re never going to do it. So, how do you tap into the motivation when you just don’t feel you have it? What if all you’re managing at the moment is the drive to come home after working as little hours as possible, and settling in with takeaway for the night? Does that not just sound like the easy life? Well, sure. But it certainly isn’t sustainable. So focus on the future life you want for yourself. What do you want your life, and the life of your family, to look like in 6 months? 5 years? 10? We bet that when you think of a job that pays a lot, you’re thinking about a high end job. A business owner perhaps, or a doctor. But there’s no need to box yourself in, newbie hustler. No need at all! Now that your drive is fueled by a vision of your future life, what path will your career need to take to get you there? Talk to your superiors at work about the best ways to get on this upward trajectory. Figure out what it will take and make a plan. Will you need further education? More clients? A stronger networking hustle? Then, consider ways to grow your side hustle, too. Who says you can’t piece together a career out of multiple parts! You gotta make your money work for you! You might be eating out all of the time rather than doing a weekly shop. You might be a sucker for buying designer clothes, when you already have a wardrobe full of them. Hustling means learning how to manage your money effectively. Make sure that you’re using technology to help you. There are apps out there for planning literally all points of your life, and they’re really good at planning your money, too. If you have a set budget to follow, with automated savings, it makes money managing a breeze! You really do need to love your work, or you’ll never fully enjoy the money you’re hustlin’ so hard to get. Now that you have your budget in order, you have a better idea of how much money you need to realistically bring in to sustain your lifestyle and set aside for the future. This allows you a bit more freedom to follow your passions, to make career decisions on more than where the money is. Remember: You need to make sure you’re actually happy earning the money. Your hustling journey continues, but now it’s about more than money…you don’t get comfortable, you just start hustling for YOURSELF. Finally, even at the most passion-project of jobs, work is still work. And they call it work for a reason. You’re still going to have to learn to push through the daily grind. Hone interests outside of work…pursue passions that have nothing to do with a hustle…practice self care. Happy hustlin’! What does your current hustle look like? Congratulations! Your blog has graduated from a fun hobby and creative outlet to something that is pulling in a bit of money on the side. This is an amazing development! But now what??? If you’ve decided to roll with it and turn your much-loved baby blog into a full-fledged side hustle, there are a few things to keep in mind. Blogging can be a fun way to make some extra cash, but only if you’re prepared to put in a fair amount of work. While Finding Delight is by no means my full time job, I do consider it profitable enough to be included in the lil pie chart in my brain that is titled “work.” Unfortunately, there are a lot of resources out their for folks lookin’ to turn their lifestyle blog into the whole dang pie but not that many for those of us who are happy with keeping it at a good, hearty slice. First, successful blogging is just one chunk of your life. So it needs it’s own chunk of time! Schedule dedicated time for your blog that is separate from the hours you need for your main income source but also separate from your home life, too. It took me awhile to get a hang of this and I would often let blog stuff leak into both realms. My saving grace in this department was definitely my perfect planner. This thing lets me schedule my day down to the half hour–which might sound crazy to some! But if I can see where in the week I have “blog work” scheduled (always highlighted in a pretty pink! ), I’m less likely to pop into WordPress when I should be working or email that company back when I’d rather be hanging out with my husband. I think there’s a tendency among bloggers to stack their plates too high. When something that started out as a hobby becomes a part-time job, it can be hard to reconceptualize. It doesn’t feel like work. However, you might find that there is great potential and power in slowing down and allowing some time for yourself. Last week I didn’t put up a single blog post because I wanted to give my full attention to a new project I was really excited about. And that’s ok! Sure there are things I do, like affiliate linking, that allow my site to make money without me around. But for the most part, I just don’t worry about it anymore. Think about this time away from blogging as the space in which content can be born! You allow yourself time to read books, or play games (www.finalfantasyxvapp.com#home), or travel, or bake a cake…whatever it is that you enjoy…and then you’ll have these rich experiences and opinions to share with your readers later! Will I enjoy creating this? Will the readers I currently have gain something from this? Can I optimize or monetize in some way? Could this encourage new folk to join my tribe? Does your job keep you up at night because you’re thinking about the horrors the next day will bring? Does the thought of clocking in give you a queasy feeling? If so, you may feel as though you’re trapped, but I’m here to tell you that there is a way out. A wise person once said if you can find something you care about and mix it with something you love doing …bada bing, bada BOOM… you have found your perfect job. Sadly, not many of us approach our career in this way, and this is often what leads us to get stuck in the first place. Luckily, there’s still time to work out what your task preferences and passions are in terms of work. This will help narrow down the field. For example, you may feel passionately about educating others and facilitating learning, while the sorts of tasks you enjoy involve visual creativity. If so, then a suitable combination might be an art teacher or a graphic design artist that works in the education sector. In terms of freelance work, you may want to explore creating infographics. What this example demonstrates is how identifying your passion and your preferred tasks will put you in a much better position to brainstorm jobs which combine the two. Making the work meaningful AND rewarding. Of course, once you have a perfect job to work towards, you need to plan how to get there. This may involve starting a job hunt as you inch towards a completely new career. It could also mean speaking to your superior about taking on tasks at your current job that better fit the bill. If seeking further education is necessary to make your perfect job a reality, some great options that allow you to work while you do so. Just a quick google search for options in my own area led me to the online degrees available at https://businessdegrees.uab.edu/ but there are options all across the world. Another great way to find them besides a google search? Seek out someone employed in your perfect job and ask them the steps they took to get there! Do they recommend a specific school or certification? Most people love talking about themselves so don’t be shy. Finally, if you are falling out of love with your job, starting a side hustle (lots of great ideas suggested here – https://www.ryrob.com/ ) or your own business can be a fantastic idea. In fact, doing so could provide you with the opportunity to see if the combination of your passion and preferred tasks are actually a good fit, as well as giving you the chance to work towards something that has meaning for your life and that you control. A few years ago, I realized I was passionate about helping small businesses communicate their brand and that I loved writing and creating marketing materials. Unfortunately, I was already employed at a job I wouldn’t describe as perfect. Instead of looking for a different job that would fulfill my passion + preferred task criteria…I just started doing it. I found businesses and people to work with, offering my services until I found a way to make it stick. 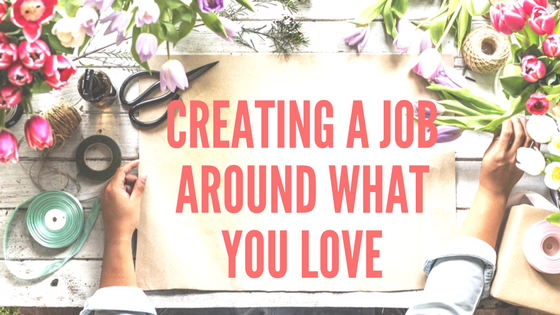 At the time, this side hustle was a perfect way for me to stay in love with the not-so-perfect job. And now, I KNOW that combination is a good fit! So, if you find yourself falling out of love, make the first move. Ask yourself – What do I care about? What do I love doing? The rest will follow if you let it! Looking for a Second Income Source? Freelance – There are so many options for freelancers today. All you need to do is a quick search online and you will find tons of websites designed for freelancers. Many of them work like this: Someone looking for a job to be completed will post a listing, and interested parties will make an application. If your application is accepted, you submit your work and the money will hit your bank or PayPal account. If you have skills that can be put to use over the web — such as writing, photography, or web design–this could be a great fit! Start a blog – A blog won’t make you money overnight, but if you have something you are passionate about (a niche! ), starting a blog is a great step towards generating income in the future. Once your blog is going, and you’ve built up an audience, there are a number of ways to make money — from sponsored posts to affiliate marketing. Invest – Another way to make money is by investing. However, this is not something you should dive straight into. Take the time to read feedback, such as these thinkorswim reviews, which enlighten you to various brokers and investment products so that you are informed on the pros and cons. Before you can invest, you need to make sure you are aware of your attitude to risk and that you only invest within your means and your comfort levels. Share economy – The share economy is booming…and for good reason! You could drive for Lyft, deliver Instacart orders, or rent out your spare room on Airbnb. But if these aren’t for you, there are other ways to earn a bit of cash while also helping out others. Evaluate what you have and consider if sharing might be of value to someone. For example, if you live in an area that is close to a lot of businesses, you could look into renting out your driveway. Looking for a second income source but not sure what would be a good fit? Let’s bounce around ideas in the comments! Or feel free to shoot me an email. Do any of you have any “wins” when it comes to diversifying income streams that you’d like to share? If you do, drop ’em below! Websites are getting easier and easier to make because of all the wonderful information you can access (for free!) out there. There are entire free programs dedicated to teaching the world about coding, so you’re in for a win when it comes to designing your own website. And you’re going to need one! Websites make sure all of your information, content, and products are kept in one neat place for people to find. If a customer has to chase you over multiple media channels, they’re going to give up at the first hurdle. It also presents your business as a little less legitimate at the end of the day; having to follow a digital trail does not instill a sense of security for people’s payment details! Your goals are what will keep you churning out quality content and products you enjoy making for months and years to come. Set a short term goal and a long term goal for your business and put systems in place to achieve them. Keeping sight of how you want your life to look in six months, 3 years…even ten years(!) will keep you from stagnating, and your passion will stay your passion. So maybe you want to reach $500 by the end of the month. If so, make sure you work as much as you can towards that one goal. I’m talking laser focus! While it may feel like a drop in the bucket towards the annual salary you’re used to, when you’re first starting out it’s a milestone. And it’s absolutely achievable. AND it will give you a lot more motivation to keep going and start bringing in an amount with a few more zeros. At the end of the day, expansion is simply another goal to reach towards. If you’re making enough money to support yourself in the field of your passions, perhaps it’s time to set your sights higher. But what if you don’t have the funds? What if you’re not sure whether you can make the right amount of money to hire on someone else or pay for a marketing campaign? Don’t worry, there’s plenty of funding sources out there that pay out and pay off. Ladies, consider taking out a women’s small business loan with a trusted company; it’ll keep you motivated to keep earning, and can give you the leg up you’re looking for. Sometimes a small amount of debt is worth it to keep the headaches of financial uncertainty from straining your passions! Creating a business around your passion is a fun step forward in total self employment. Would you try it? Have you? Tell us about it!